After 3 years of negotiations since the ICAO 38th Assembly in October 2013, the ICAO Member States agreed on October 6th 2016 to implement a Global Market-Based Measure (GMBM) to compensate post-2020 emissions growth from international aviation. The Plenary session of the UN aviation’s 39th assembly recommended adoption of a final resolution introducing the Carbon Offset and Reduction Scheme for International Aviation (CORSIA). Verifavia's Aviation MBM / MRV experts are closely following the updated information on CORSIA and also EU ETS in regards to the 39th Assembly outcome, and are available to train and support airlines on their way towards their first CORSIA verification..
Aviation accounts for about 2% of global emissions, and international aviation represents 1.3%. ICAO has been discussing the topic of CO2 emissions from international aviation for decades. However, in 2010, ICAO adopted two sectoral aspirational goals, 2% annual fuel efficiency improvement and carbon neutral growth from 2020. In October 2013, the 38th Session of the ICAO Assembly adopted Resolution A38-18, which resolved that ICAO and its Member States, with relevant organizations, would work together and strive to achieve a collective medium term global aspirational goal of keeping the global net CO2 emissions from international aviation after 2020 at the same level (so-called "carbon neutral growth from 2020" or CNG2020). The Assembly also defined a basket of measures designed to help achieve the ICAO's global aspirational goal. This basket includes improved aircraft technologies and procedures such as lighter airframes, higher engine performance and new certification standards, operational improvements (e.g. improved ground operations and air traffic management) and sustainable alternative fuels. Unfortunately these initiatives are largely surpassed by the predicted growth of aviation sector. In order to achieve its goal ICAO focused in the past three years on the last measure of the basket which is the global market-based measure, which is a preferred approach to local and regional initiatives. Moreover ICAO had to take into account the 2015 UNFCCC Paris agreement and complement its ambitions. Paris agreement includes only domestic aviation and international aviation emissions are under ICAO’s responsibility. ICAO has agreed that the GMBM will be a Carbon Offsetting and Reduction Scheme for International Aviation (CORSIA) rather than a cap and trade system like EU ETS. This scheme will therefore require the airlines to offset some of their emissions but not necessarily reduce their own emissions. According to the Assembly Resolution, the average level of CO2 emissions from international aviation covered by the scheme between 2019 and 2020 represents the basis for carbon neutral growth from 2020, against which emissions in future years are compared. In any year from 2021 when international aviation CO2 emissions covered by the scheme exceed the average baseline emissions of 2019 and 2020, this difference represents the sector's offsetting requirements for that year. ICAO has decided on a phase-in implementation to accommodate special circumstances and respective capabilities (SCRC) of contracting States. The scheme will be voluntary at the beginning, followed by participation of all States except the exempted States. Pilot phase (2021-2023) and First phase (2024-2026) applies to States that have volunteer to participate. Second phase (2027-2035) applies to all States except the exempted States unless they volunteer to participate. Exempted states are all States that have an individual share of international aviation activities in RTKs in year 2018 bellow 0.5 per cent of total RTKs or whose cumulative share in the list of States from the highest to the lowest amount of RTKs is less than 90 per cent of total RTKs. Exempted States are also Least Developed Countries (LDCs), Small Island Developing States (SIDS) and Landlocked Developing Countries (LLDCs). States that decide to volunteer to participate may do so by joining from the January 1st of a given year and notifying ICAO of their decision by June 30 the preceding year. The volunteering States have also the opt-out option. Same rules for notification apply. As of 23 August 2017, 72 States intend to volunteer in participation in the global MBM from its beginning. or humanitarian, medical and firefighting operations. Moreover a new entrant is exempted from the application of the CORSIA for three years or until the year in which its annual emissions exceed 0.1 per cent of total emissions in 2020, whichever occurs earlier. From the subsequent year, the new entrant is included in the scheme and treated in the same way as the other aircraft operators. To ensure a level playing field between all airlines flying on the same route, the coverage of the scheme is defined on routes basis. A route will be covered by the scheme if both States connecting the route are participating in the scheme. A route will not be covered if at least one of the States connecting the route is not participating in the scheme. Emissions from international routes not covered by the scheme will not be redistributed. Coverage of routes can change over time as States decide to volunteer (or opt-out) and once the scheme becomes mandatory. 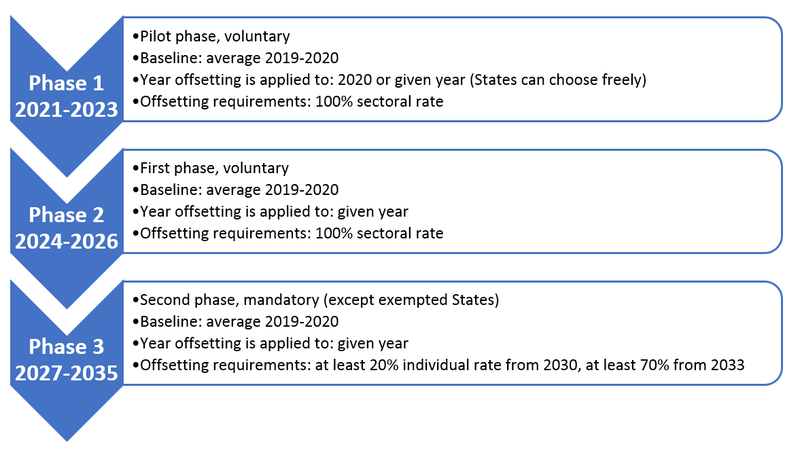 Once participation of States and routes covered by CORSIA in a given year are set, the offsetting requirements will be calculated. Offsetting requirements are the emissions which need to be offset, i.e. the emissions increased above the baseline. Baseline for CORSIA is determined as average emissions from the years 2019 and 2020. The offsetting requirements are then distributed among aircraft operators as per formula defined by the Resolution. The resolution also establishes a three-year review of the effectiveness and ambition of the scheme. In 2012, EC agreed on suspension of extra-EU flights from the EU ETS, the so-called “stop the clock”, in order to give ICAO time to reach a global agreement. This derogation automatically ceased from 1 January 2017, so the full scope of Aviation EU ETS is officially in force. The European Commission has proposed on the 3rd of February 2017 that a continuation of the ‘stop the clock’ intra-EEA scope of the EU Emissions Trading System (EU ETS) for aviation would be the most suitable option to address the period 2017-2020. The Commission proposes to extend the current approach until there is sufficient clarity about the nature and content of the legal instruments adopted by ICAO for CORSIA to allow it to carry out further assessments and to review the EU ETS for the post-2020 period. The adaptation of the proposal is expected by the end of 2017, beginning of 2018 the latest. ICAO has noted and emphasized in the Resolution that CORSIA should be the single global carbon offsetting scheme instead of “patchwork of State and regional MBMs”. This is supposed to prevent double counting of emissions and be more cost-effective. In the view of this statement it seems unlikely that Aviation EU ETS would run in the form that it is in now post 2020.
the EU will continue EU ETS only for EU domestic flights, CORSIA will cover all international flights. CORSIA’s cornerstones to be agreed and published by ICAO are the MRV (methodology for monitoring, reporting and verification of individual operators’ emissions), EUC (Emissions Unit Criteria) and the registries. However, ICAO has already stipulated in its Resolution that it will provide assistance to all states to put in place the necessary infrastructure and priority will be given to the states who volunteer. The airlines will be able to fulfill their offsetting requirements by purchasing offset credits from carbon markets. The emission units (one unit equals to 1 tonne of CO2) will be therefore reduced outside of the aviation sector. Emissions Unit Criteria are yet to be worked out but it is clear that some carbon units generated from UNFCCC mechanisms and the Paris Agreement may be eligible for use in CORSIA provided they align with ICAO’s technical quality criteria and avoid double-counting. Offset units from UNFCCC Clean Development Mechanism and programme REDD+ will be most probably used. The technical quality criteria of the emissions units used in CORSIA will be crucial. These criteria need to make sure that a tonne of CO2 emitted by an aircraft operator will really equal to a tonne of CO2 saved somewhere else. Verifavia provided Aviation EU ETS / MRV training and capacity building to the Turkish DGCA and Turkish airlines. VERIFAVIA provided CORSIA training to the airlines of Malaysia and to the personnel of the Civil Aviation Authority of Malaysia (CAAM) on 12 February 2019 at the CAAM head office in Putrajaya, Malaysia. CORSIA Training Courses - Two new sessions open!